Science Teaching Junkie, Inc.: Uh Oh! Guess What Day It Is? Hump Day! Uh Oh! Guess What Day It Is? Hump Day! Get your students excited about vocabulary review and bring your word walls to life. Keep your eyes out - it's coming soon! You can really "sell this" to your students by incorporating it into your weekly or biweekly routine on Wednesdays. As your students enter your classroom just say "Uh Oh! Guess what day it is? Guess...what...day...it...is? Hump Day!" 1) My principal encouraged us as a campus to do a better job of bringing our word walls to life. So many of the teachers on my campus have word walls posted (simply to comply with the expectations of administration), but when the principals do walk through's, they don't see the word walls being utilized. In fact, many of the students don't realize the terms are even posted in the classroom. 2) My 6 year old daughter received the game "Hedbanz" for Christmas. It was fun for all family members of all ages. It really makes you think and ask specific questions. You really have to know everything about the object that is on your head that you are trying to guess (both for the guesser and the other players). 3) I am always looking for a way to make science vocabulary acquisition more interesting for my students. No matter what I do, it always seems to be like a boring chore I am forcing them to do. Most of them simply go through the motions and if I ask them questions the next day, they can't tell me a darn thing about the vocabulary term. Obviously, what I'm doing isn't doing the trick. 4) Who doesn't love a game?!? E-nuff said! 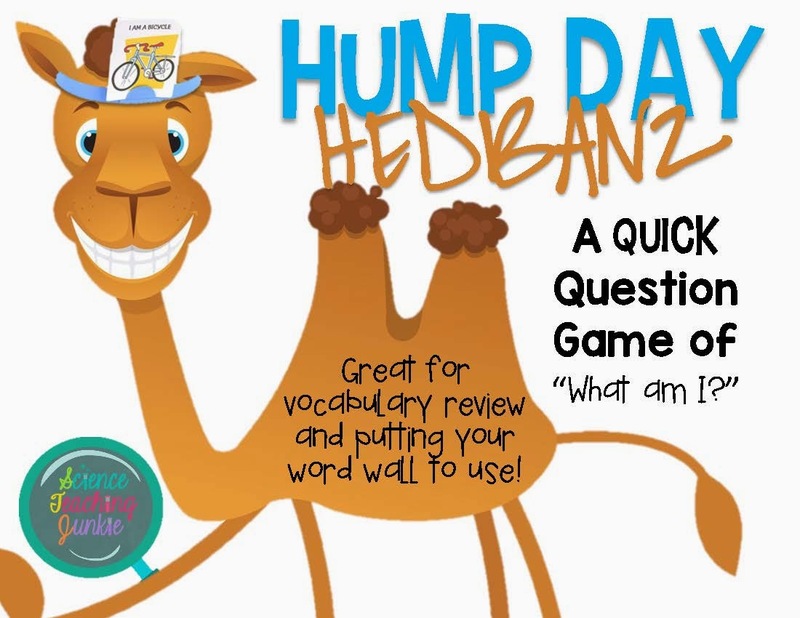 Enter to win your own free copy of Hump Day Hedbanz! What a fun idea! My students would enjoy something like this so much, especially if they got to play a game in the middle of the week. I'd use this as a weekly review of our current words and also as a fun way to review all the vocabulary learned so far this year. What a fun idea! I can't wait to see your idea to use it. I would use this as a weekly review game on Wednesday, of course! I've been looking for some way to get the kids familiar with the vocab words, this would be something that would really interest them, what a great idea!